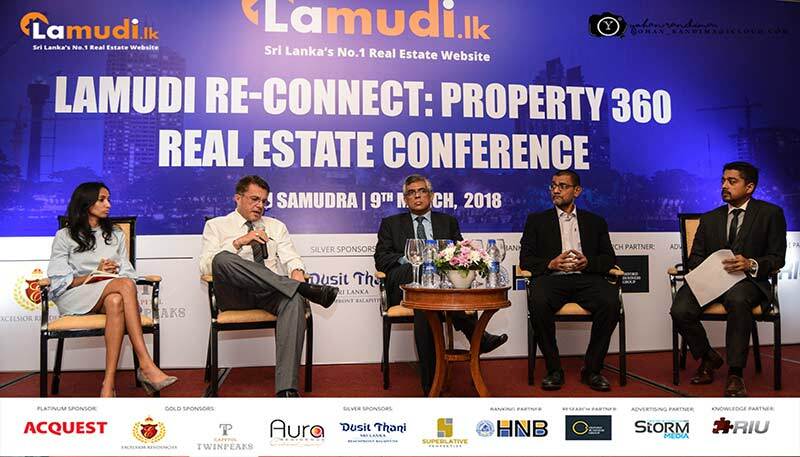 Showcasing this burgeoning real estate sector, the prominent and leading property portal, Lamudi, successfully launched its real estate conference ‘RE-Connect: Property 360’ at the Taj Samudra on the 9th March 2018. The event was sponsored by many leading real estate organizations including ACQUEST as the platinum sponsor, Excelsior Residencies and CAPITOL TWINPEAKS coming in as gold sponsors, Aura Residencies, Dusit Thani and SUPERLATIVE Properties as Silver sponsors. The official banking partner was HBN. Oxford Business Group joined the event as the research partner and RIU was the official knowledge partner. Furthermore, Storm Media came in as the official advertising partner for the event. Conceptualized by Lamudi.lk, the leading property portal in Sri Lanka, the event was graced by Dr. Jagath Munasinghe, Chairman of the Urban Development Authority (UDA), and featured some of the real estate industry’s giants such as Capitol Towers, Dusit Thani, Aura Residence, Excelsior Residencies, Acquest and Superlative Properties. The exhibition also included presentations by industry experts such as Roshan Madawala from RIU, Ravi Abeysuriya from Candor Group and Suresh Perera from KPMG, sales meetings, and a panel discussion as well as a networking and relationship building session. As in the past, the conference brought together investors, buyers/sellers, developers and industry experts from all around the island and the region to share knowledge and network. The panel discussion addressed key focus topics such as industry trends, the role of government authorities and regulators, the forecast for the local market and the region as well as the role of ICT in the industry. Commenting at the opening of the conference, Mr. Nitesh Khirwal, MD of Lamudi Sri Lanka, stated, “Lamudi.lk is proud to present RE-Connect: Property 360 Real Estate Conference, which will bring together developers, investors, buyers, regulators and consultants to facilitate knowledge sharing and discussion about the current state of the Real Estate industry, outlook for the future, regulatory landscape and attractive projects to invest in”.